« At this time in history, we are to take nothing personally, least of all, ourselves. For when we do, our spiritual growth and journey comes to a halt. All that we do now must be done in a sacred manner and in celebration. We are the ones we have been waiting for! » Read theHopi Indian’s poem here. Adventure: encouraging the discovery of new frontiers throughout life. Knowledge: bringing knowledge and resources into focus at a single event (the annual expo event). Leadership: the field of gerontology is ever evolving, reflecting upon itself, challenging the status quo, and seeking new methods to respond to, and serve, the aging experience; cutting edge thinking and challenging ideas are a vital aspect of what we do. Grassroots: committed to being a natural and spontaneous expression of community, driven by volunteerism, responsive to local needs and expectations, and non-partisan in outlook. Bill Thomas started touring the United States spreading a message of hope and a wake up call. In 2015 his tour hit 15 cities and in 2016 he’s doubling the number and will be in 30 different US cities including Cape Cod, Sioux Falls, Waco, Providence, Madison and Houston. The 2016 Program adds a new element: “disrupt dementia”. The purpose remains the same: to introduce audiences to a very simple but fundamentally counter-cultural concept — AGING equals GROWTH. His vision is to empower people to “play life’s most dangerous game” (aka aging) by opening their eyes to the possibility of growth late in life that our ageist culture has told them does not exist. 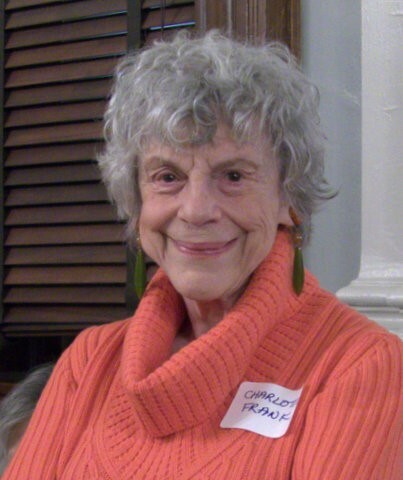 Charlotte Frank died suddenly at home over Thanksgiving weekend. Family and friends deeply mourn the loss of this visionary leader, co-founder of The Transition Network, a national organization for women over 50, and the Caring Collaborative. The Pass It On Network pays tribute to the co-founder of one of the cutting-edge civic models of recent years – The Caring Collaborative, a program we’ve been promoting since we started. In 2000, faced with her imminent retirement after a challenging professional life, Charlotte Frank, in her sixties, wondered: «What’s next?» Instead of just talking about the problem, she co-founded, with fellow-retiree Christine Millen, The Transition Network (TTN), an organization of engaged, energetic women over 50 who actively support each other as they navigate their “transitions” from work to retirement, as well as through all the other “transitions” inherent to the second half of life – changing careers, surviving relocation, adapting to widowhood or divorce, continuing to grow, learn, advocate. She earned an Ashoka Fellowship for social entrepreneurship and built TTN into a professionally-run non-profit organization. It’s grown into a fabulous sisterhood. TTN’s has built a signature social structure that fosters friendship, intimacy, community and advocacy—the Peer Group—comprised of 8 to 10 women who meet once a month to discuss issues or participate in events together. Today, in New York, there is a Peer Group for every activity and interest. Anyone who has an idea and can find 8 to 10 women to share it, can launch a group to meet her interests and needs. When illness struck Charlotte in 2006, and she discovered the difficulties of navigating the healthcare system in New York City. True to form, she decided to do something about it. In the fall of 2007, under her direction, and competing against many other organizations, TTN won a two-year grant of almost $150,000 from the New York State Health Foundation to develop a low-cost pilot project—built on the principles of the barter system—which demonstrates that informal communities can play a positive role in caring for those over 50 with health issues. “That’s an age when health problems begin to emerge,” say Charlotte is quoted as saying, “but there are no formal programs for making sure they get the attention they need. This is particularly important in a city like New York where a number of single women reside.” In 2008, The Caring Collaborative hired a manager and established a database so that TTN members can exchange health support services through a Time Bank, as well as share medical information and resources. Today, TTN’s Caring Collaborative, organized by zip code, has more than 200 members in New York City and has spread elsewhere. Anybody can find guidance for starting a similar operation. Click on any title to view and/or download each of these manuals. COP 21 – The French Système D* par excellence! Strict security measures following the Paris terror attacks of 13 November included the banning of the marches planned throughout France on Sunday 29 November. Throughout the world more than 20,000 marches were held mobilizing the masses. Throughout France it was the “Système D”* par excellence. 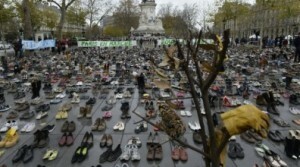 The Place de la Republique was covered with 8 tons of shoes – all in marching order. 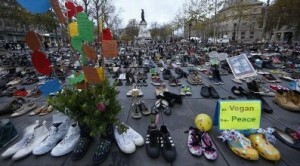 The Pope and Ban Ki Moon, secretary general of the UN both sent a pair of shoes to “march” with the demonstrators. A human chain was formed despite the interdiction. *System D (in French, Système D) is a shorthand term that refers to a manner of responding to challenges that requires one to have the ability to think fast, to adapt, and to improvise when getting a job done. The term gained wider popularity in the United States, after appearing in the 2006 publication of Anthony Bourdain‘s The Nasty Bits. Bourdain’s sous-chef likens the use of System D to being a modern-day MacGyver. 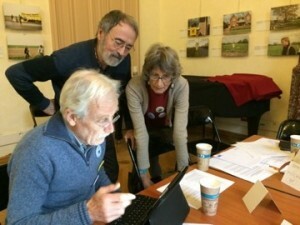 Jean-Michel Corre (standing), his wife Thérèse from Belgium and Jean-Claude Lalou from Switzerland, put the finishing touches to the Alliance’s founding document in Paris. Svein Tveitd, Climate and Polar Expert and former Director at the United Nations Environment Program, founded Klima 2020 in 2008 to carry on working on Climate Change. Today his ideas and convictions have spread and he has been a decisive figure in the founding of the new International Alliance of Grandparents for the Climate. Six countries signed an agreement in Paris on November 28, 2015 – France, Belgium, Switzerland, Canada, United Kingdom and Norway. Their object is to continue campaigning for a just transition to 100% renewable energy by 2050. 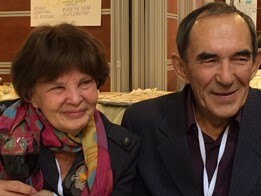 Estelle Le Touzé, founder of the French Grandparents for the Climate in August 2015 was inspired by what was happening elsewhere in Europe. She found herself in a kingpin position with the COP 21 taking place in Paris in December. 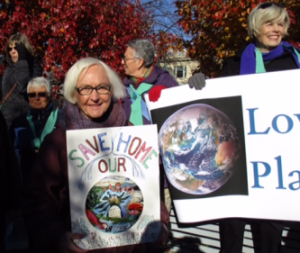 Here’s Jan Hively, Pass It On Network’s co-founder, marching with her sign “Save Our Home: Leave a Legacy of Love”, in Provincetown, Cape Cod, Massachusetts — at the easternmost point of the U.S.A. Pass It On Network featured Estelle’s initiative in August and was happy to « pass on » contacts received from Elders Climate Action in the United States of America. Estelle added them to hers, continued her contact work and found solid support from the most senior among them, Svein Tveitd’s Klima 2020. 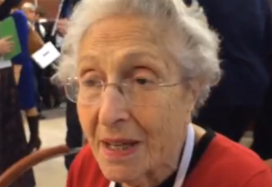 Also see Grands-parents pour le climat – Paris. Svein Tveitd, Estelle Le Touzé, and Jean-Michel Corre. Armoogum Parsuramen – What a wonderful welcome from Mr Armoogum Parsuramen, when he responded to request from Hans Kristjan Gudmundsson, our liaison from Iceland, to meet our international coordinator who was visiting Mauritius. He is the Founder-President of the Global Rainbow Foundation (GRF), The University of Third Age (Trust) Mauritius (U3AM) and the Founder-President of Senior Citizen Solidarity (Mauritius) Foundation and so much more. He has wide international experience and is applying his life’s experience to seizing the opportunities aging offers across the spectrum. Read full bio. Prof Vsevolod Rozanov, MD, PhD – Pass It On met Prof Rozanov in Moscow in October 2015 at the Society for All Ages conference. Born in Odessa, Ukraine, he is professor of suicidology and behavioral genetics at the chair of clinical psychology of the Institute of Innovative Post-Diploma Education of Odessa National Mechnikov University. He’s running a very innovative inter-generational Life Long Learning project that Pass It On will be featuring in the future. 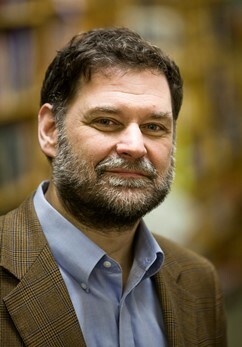 He is author of many published articles, chapters and books. He is also a leader of the Human Ecological Health NGO and popular lecturer and educator. Read full bio. It is time for the European Union as a whole and national governments to be held accountable for the rights they put on paper but do not put into practice in relation to specific groups. 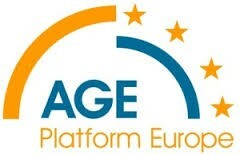 This was the strong feeling expressed in the Final Declaration attending the Annual General Meeting of AGE PLATFORM* in Brussels in November 2015. 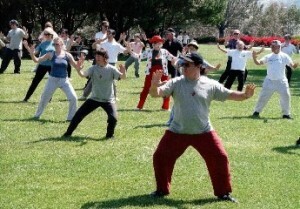 Tai Chi was the example used at a full day’s event preceding the annual general meeting of Age Platform in Brussels on the important of physical exercise in maintaining good health. Acknowledge older people’s rights and ensure they underpin the silver economy to guarantee that its innovation potential is used to meet the specific needs of Europe’s aging populations. To celebrate the 25th United Nations International Day of Older Persons, Age Platform launched an online Older Persons’ Self-Advocacy Handbook intended to support the involvement of older persons in all processes that affect their human rights. 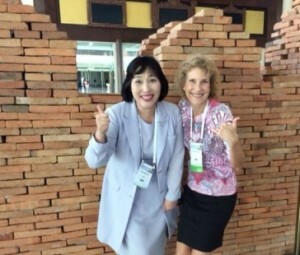 Prof Kathryn Braun (right), Professor and Director, Office of Public Health Studies, University of Hawaii and President of ACAP, with Dr Dong Hee Han Director, Research Institute of Science for the Better Living of the Elderly and editor of ACAP’s newsletter at a recent meeting in Thailand. ACAP celebrates 10 years of growth and positive, active collaboration with 11 countries in Asia Pacific. It is the fruit of the inspiration that Prof. Takeo Ogowa of Fukuoka experienced at the UN Madrid meeting when the Active Aging Policy Framework was adopted in April 2002. He took his marching orders very literally, went home to Japan and started laying the foundation for spreading active aging in Asia Pacific. The 10th anniversary conference of ACAP from 5-7 March 2016 in Fukuoka and will start off with an exhibition organized by the city of Fukuoka on Active Latter Life. The Pass It On Network’s co-founder and international coordinator, Moira Allan, will be attending. 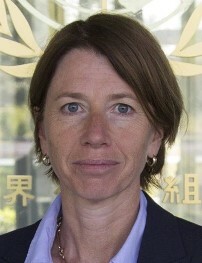 Alana Officer, Senior Health Adviser, Department of Aging and Life Course, WHO Global Network of Age-friendly Cities and Communities, Switzerland, presented the World Health Organization’s World Report on ageing and health 2015 that outlines a framework for action to foster Healthy Aging built around the new concept of functional ability. It is available in 6 languages. Moira Allan presented the Pass It On Network during the opening plenary session on “the quality of life of the elderly.” She was seated next to Alana Officer, of the World Health Organization. Dr. Gulnara Minnigaleeva, the Pass It On Network’s liaison in Russia, introduced our network to the Timchenko Foundation, organizers of the conference. She ran a workshop on « Areas for all Ages », attended by her parents, both very active organizers of the Wisdom Ripening Association they founded in Tuymazy in the Republic of Bashkortostan. 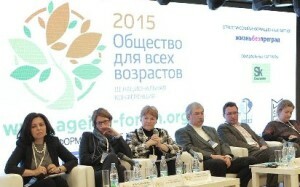 The third edition of the National Conference Society for All Ages attracted national and international leaders to Moscow in October 2015 to explore the key topic of The Environment for Aging. What issues do we face as we become older? How can we impact the environment in order to make it age-friendly and to ensure that the natural aging process provides opportunity for self-actualization and active longevity as opposed to exclusion from the society? Click above image for an English translation of the program. Marie-Françoise Fuchs, President of Old’Up, and all her team scored a brilliant success with the full day symposium on The Emerging Spirit of Elderhood, held in Paris in October. They have shifted the lines and created a buzz around the question of aging. The association has been inundated with requests for information and requests to start “Old’Ups’ in several places around the country. For those who speak French, here is a full recording of the day’s proceedings: Comment l’esprit vient aux vieux. A book will be published in September 2016. 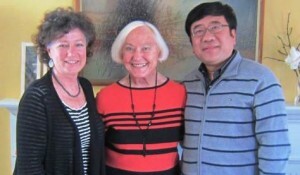 Dr. Jan Hively (center), Co-Founder of the Pass It On Network, and Co-Creator of ALPA (Advocay Leadership for Positive Aging) with Kathie Bailey, Director of Aging Services, who is leading the Age Friendly Community project in West Yarmouth, Cape Cod, and Professor Mi, Head of the Center for Population and Development Studies at Zhejiang University in China. Dr. Hively will be in China from December 2 to 12 to talk about ALPA “Advocacy Leadership for Positive Aging”. She is part of the Age Friendly Community project in Yarmouth. The main event for the trip is a conference at Zhejiang University, where our host, Professor Mi, heads the Center for Population and Development Studies. It’s funded by a Ford Foundation grant to the university’s Social Security Policy Simulation and Demographic Data Mining Lab. Before the conference, they will be in Shanghai for a couple of days, and afterward, they will spend time in Nanjing and in Souzhow. We look forward to a first hand account. PARIS CLIMATE CONFERENCE COP 21 2015. Information direct from the Paris Climate Conference from UUs will be posted here. See also the UUs In Paris Facebook page.